5) Bosch PL2632K Planer with Carrying Case, 3 1/4"
3) Bosch PL1632 6.5 Amp Planer, 3-1/4"
Shopping for high-quality handheld planers could be difficult if you have little to no idea about the features and benefits of the best kinds of handheld planers. Handheld planers might not only serve you its purpose of smoothing surfaces and removing excess material on surfaces – it might serve you its purpose for quite a long time, if scrutinized carefully. So, to help you in your search for a high-quality handheld planer, here is a guide that might give you a tip or two in choosing the best handheld planer for your necessity. Hopefully, you will find this guide useful and informative. If you need to have your door’s edges smoothed or have the paint removed from a piece of wood, it would be costly if you will hire someone to do the job. It would also be impractical to purchase a new door or a new piece of wood – though you could really do such a thing if you have heaps of money. But, if you want to spare yourself from the expensive and save money, you could purchase your own tool for you to do the job. Woodwork that requires surface smoothing and material removal will only need a high-quality handheld planer. If only I had known the difference between a high-quality handheld planer and a low-quality one, I could have saved myself from wasting time and spending much on a useless handheld planer. A great handheld planer will not only serve me with the purpose it is made – it could serve me for long years. Plus, it could also keep me active with all the DIYs. 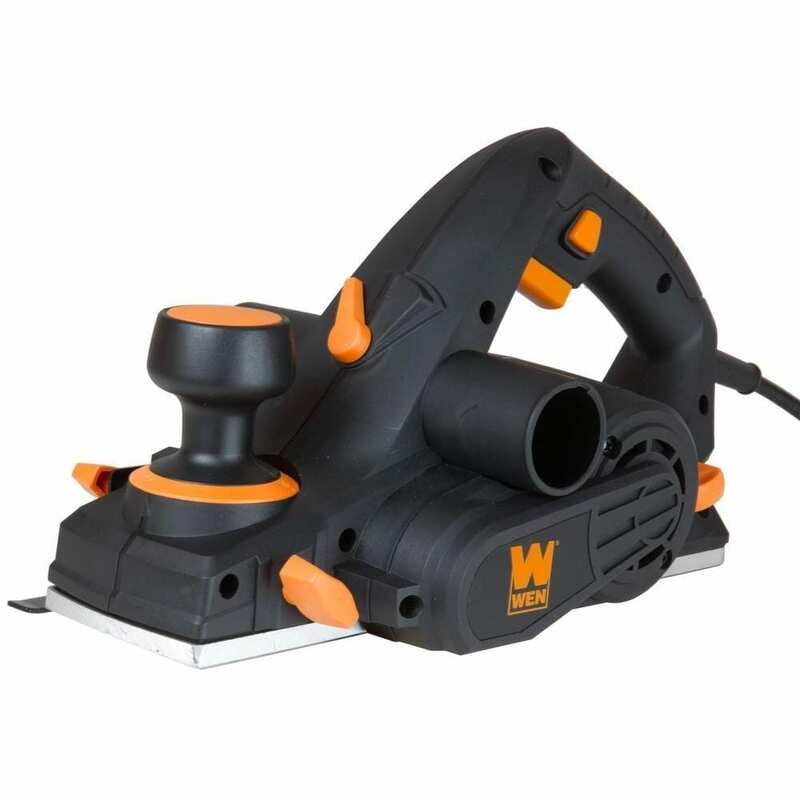 This handheld planer from WEN might be the ideal handheld planer for you if you need one that is affordable and efficient at the same time. This planer features a 6-amp motor which provides as much as 34,000 cuts per minute. It also contains 16 positive stops for cutting depth adjustments between 0 to 1/8 inches. Other than that, this planer can also create rabbets with 1 inch size using its 5/16 inches rabbeting guide. It is also lightweight and small, thus making it easy to carry around, bring at work and store at home. The planer comes with a dust bag, a parallel fence bracket, a power planer and a kickstand. PORTER-CABLE PC60THP Hand Planer is another budget-friendly planer that is packed with amazing features. 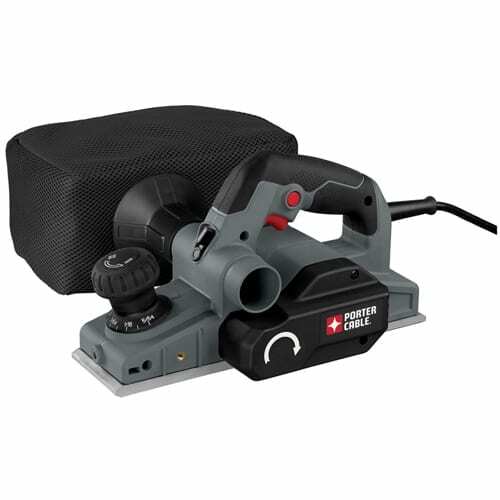 It is equipped with a heavy duty 6-amp motor that offers a smoother cutting on a variety of surfaces, especially hard woods. With a dual side dust extraction feature, the planer enables the extraction of dust and dirt on either on the left or on the right. This planer also contains an over-mold depth knob consisting of 10 positive steps. Plus, with 3 grooves for chamfering, you are given 3 options for edge chamfering. If you are looking for a durable, easy to use, efficient but lightweight handheld planer, then this planer by DEWALT might just what you need. This planer contains a powerful 7-amp motor that promises a smooth, even finish in every use – even on the hardest wood. At the most, the planer could cut 3/32 inches in a single pass, thus reducing the frequency of passes. It could use high speed, large and resharpenable steel blades for straighter edging and more precise framing uses. With a calibrated depth adjustment knob, it might guarantee remarkable depth setting accuracy and elimination of re-zeroing needs in the depth settings. Makita KP0810 7.5 Amp 3-1/4-Inch Planer is capable of planing as much as 3-1/4 inches wide as well as 5/32 inches deep in one pass. The two-blade cutter head it comes with can do 16,000 revolutions per minute, guaranteeing a smoother finish and a faster removal of stock and excess material. This planer also features a depth adjustment knob with an easy-to-read scale and 0.1 millimeter click stops for depth adjustment precision. With a rubberized handle, this handheld planer is comfortable to use, thus helping lessen fatigue in extended uses. 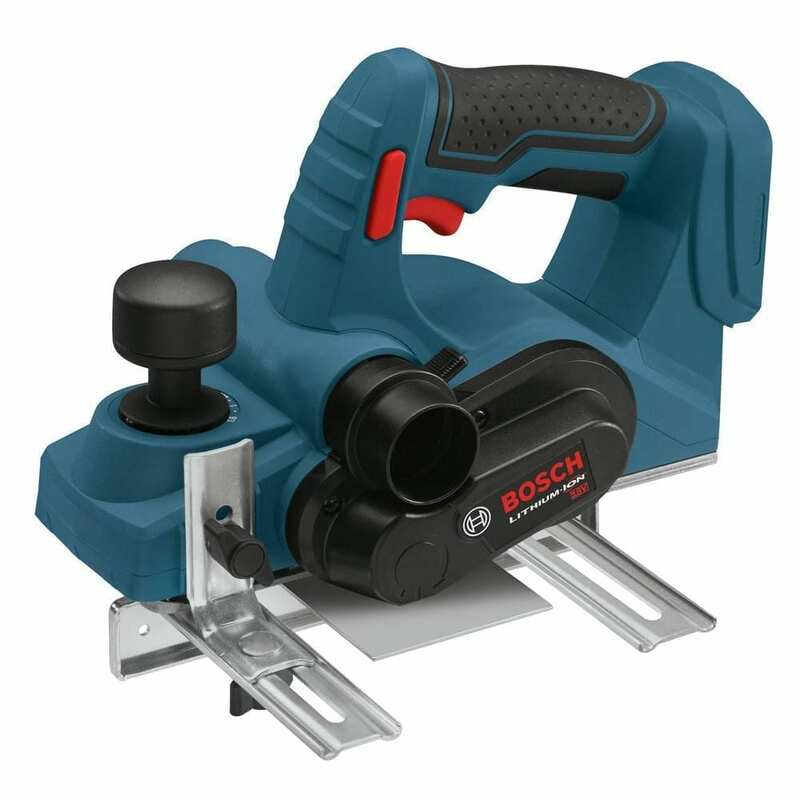 This handheld planer from Bosch features a planer on or off locking button which helps in preventing accidental start-ups and keep you at ease – this might be a great handheld planer if you are looking for one that is convenient, safe to use and heavy duty. With a 6.5-amp motor, it is able to do 16,500 revolutions per minute; such speed is enough to provide faster removal of stock and excess material, thus resulting to a smoother finish. It is also loaded with spring to elevate the tool, provide a resting spot and protect its blade. Also, its front and rear shoes are made with aluminum – it might guarantee accuracy every after assembly. Bosch PL2632K Planer with Carrying Case, 3 1/4"
A lot of people would purchase a handheld planer. It might be for their jobs, or merely just for DIY projects. But, often, a handheld planer is bought by people who frequently work with wood – professional and amateur woodworkers. Given the nature of their job, a handheld planer is definitely one of their must-have tools. Other than woodworkers, some homeowners and DIY lovers would purchase a handheld planer to do general repairs on their own. It could be used when your home’s door is stuck. It could also be utilized to remove paint on wood surfaces – the point is: it is useful to anyone who wants to purchase one. Generally, a planer is used for flattening, reducing thickness and production of a smooth surface. Such surfaces might include a piece of wood or timber. However, high-quality handheld planers are not limited to such capabilities. High-quality handheld planers multitask from the abovementioned features to producing vertical, horizontal or inclined surfaces as well as cut some joints or do some decorative moldings. When you visit the hardware or search an online shopping site for handheld planers, you’ll see that there are a lot of selections to choose from. They vary in brands, prices and features. Despite the differences, each handheld planer is built for the benefit of the user. Here are a few benefits and features which you should look for in a handheld planer. A high-quality handheld planer would need a strong motor to complete its tasks. Typically, at least 5 amps are required from the planer to do its work on the wood without applying excessive pressure. Choosing a planer with a motor power of 5 amps or more might guarantee that the planer is efficient and effective. However, if you are working more frequently or if you have to do detailed woodwork, a 7-amp handheld planer might be a better option. The speed of the planer is very much dependent on how many blades are inside the planer’s head. Excellent planers usually have more than just a single blade, thus enabling you to complete your projects faster with more accuracy and precision. So, having a dual-headed blade cutter instead of a single-headed blade is better. Dual-headed blade cutters are more useful especially when it comes to removing paint or enlarging frames. It might also lessen fatigue once the handheld planer is used for quite a time. Another important feature that must be considered in a handheld planer is a chip ejector. The chip ejector must always be facing away from the planer. It must also come with an adjustable chip ejector which will enable you to put it where you think it will be most useful. Since a planer is used on either of its two sides, the adjustable chip ejector helps prevent the dusts from hitting you. A dust bag is yet another essential feature that must be checked in a handheld planer. Such feature is important not only for the cleanliness of your work area, but also for your safety. A planer without a dust bag will definitely have the sawdust floating around like confetti – and you don’t want that, do you? It could get into your eyes. You could even inhale it. A planer with a depth adjustment feature is definitely a good one. A depth knob enables you to check the depths of the shavings and cuts you have made. This allows you to precisely cut materials as well as guarantee that it will show precise depths. Here’s a tip: for your work to be more precise, the depth adjustment feature must be small. Also, check if the depth adjuster could be locked into one place. A depth adjuster that can be locked into one place guarantees a more even cut. WEN 6530 6-Amp Electric Hand Planer, 3-1/4-Inch is equipped with a 6-amp motor that can provide as much as 34,000 cuts per minute. With 16 positive stops, it can adjust the cutting depth within the range of 0 and 1/8 inches. Also, it is capable of making rabbets with a size of 1 inch using the 5/16 inches rabbeting guide that it comes with. Its package comes with a power planer, a dust bag, a kickstand, a parallel fence bracket and a 2-year warranty. This handheld planer enables 16 positive stops which allow the adjustment of the cutting depths within 0 up to 1/8 inches. It can also increase the cutting depths through increments of 1/128 inches anywhere between 0 to 1/8 inches. Since it comes with a kickstand, it helps prevent accidental contact with the blade and the surface once the planer is not in use. The kickstand serves as a shield which prevents the unintentional contacts. Also, it works as a resting spot for the tool. The dust bag can be attached to the handheld planer either on the left or on the right. Using a switch, you can change the directional aim of the excess sawdust to direct it to where the dust bag is attached. Such feature might not only guarantee a clean work environment; it may also ensure that you are safe from harmful sawdust that may get into your eyes or inhaled. The planer is built with a double-sided blade that has a speed of 17,000 revolutions per minute. Such speed might guarantee a smooth and debris-free cut. The blades can also be reversed and it can be easily replaced, thus making it easy and convenient to use. This planer also comes with a parallel fence bracket which provides more accurate and straighter cuts. It can do so by ensuring that the strokes are accurately parallel to the wood’s edges. Such feature is useful for planing wood trims, door edges and boards. This planer comes with a dust bag which might help keep your work area clean and safe from sawdust. It has a 5/16-inch rabbeting guide which could create rabbets with the size of 1 inch. The planer contains a parallel fence bracket which provides accurate and straight cuts. It also features a kickstand which helps protect not only the planer’s blade but also your workpiece. It also serves as a resting spot for the tool. This planer enables 16 positive stops which help adjust cutting depths between 0 and 1/8 inches. It comes with a power planer, a dust bag, a kickstand, a parallel fence bracket and a 2-year warranty. The planer can be bought at an affordable price. It might only be used on softwoods or for edge planing purposes. There are some instances where the blade might go out of alignment after the set up. The dust bag does not lock in place in some instances and it does not catch all the sawdust. Sometimes, the front shoe is not fully centered. It is quite heavy – not a great companion to bring at work. PORTER-CABLE PC60THP 6-Amp Hand Planer is a heavy duty handheld planer with a 6-amp motor. It features a dual side dust extraction system which allows the extraction of sawdust on either the left side or the right side of the planer. It also contains an over-molded depth knob that enables 10 positive steps. Other than that, the chamfering grooves it comes with give you the options for your edge chamfering projects. With a heavy duty 6-amp motor, this handheld planer is capable of doing 16,500 revolutions per minute. Such speed is sufficient for removal of stock and excess material and it promises a smoother finish. This planer is built with dust extraction system on its both sides for a more efficient dust collection system. The dust bag the planer comes with can be attached on either the left or the right side to help keep your work area clean and safe from sawdust. The planer’s over-mold depth knob provides 10 positive steps which give better control of the planer and a variety of depth control settings. Also, with 3 chamfering grooves, you are given choices for your edge chamfering projects. Its 11.5 inches cast aluminum shoe offers a more controllable and more improved finish quality. Its 5/64-inch depth cut promises excess material and stock removal in a short period of time. The planer is equipped with a heavy duty 6-amp motor capable of working on both soft and hard woods. It contains a dual side dust extraction system which might guarantee a clean and safe work environment. Its over-mold depth knob allows 10 positive steps for better control and a variety of settings. This planer is built with a cast aluminum shoe, thus making the planer more controllable and convenient. The planer also contains a 0.47 inch maximum rabbet depth which enables more material removal in a single pass. It contains 3 chamfering grooves for a selection in edge chamfering. This planer comes with 2 carbide cutting blades, a wrench, a dust bag, an edge guide and a kit bag. The front foot plate of the planer is not flat. The bag that comes with the planer is quite small. The clicks and markings on the planer do not line up in any way. The pop out safety under the planer’s plate might be disturbing. It has a poorly designed kickstand. The planer produces a lot of sawdust. DEWALT DW680K 7 Amp 3-1/4-Inch Planer is a highly-durable and easy-to-use handheld planer that contains a 7-amp motor capable of providing a smoother, even finish in any kind of wood – especially hard woods. It features as much as 3/32-inch cut in a single pass, thus reducing the frequency of passes on the surface you are working on. It also uses high speed steel blades that can be re-sharpened for a straighter edging work and framing. With a calibrated depth adjustment knob, depth settings are more accurate and the need to re-zero can be eliminated. Reversible carbide blades can also be utilized for more detailed and more accurate woodwork. This planer from DEWALT contains a heavy duty 7-amp motor which promises a smoother, more even finish, even when used on hard woods. Its motor can do 15,000 revolutions per minute; such speed is enough to produce steady, levelled finishes. For straighter edging and framing uses, this planer accepts and uses large, resharpenable, high speed steel blades. It is also flexible to reversible carbide blades for more detailed and more accurate results. Its precision-machined shoe side and bottom gives smoother flat surface finishes and accurate depths as well as square rabbet joints. With a calibrated depth adjustment knob, this handheld planer offers more accurate depth settings. Also, the need to re-zero the depth and height adjustment knob is eliminated. It is also built in rubber for an increased height command. The planer is ergonomically designed to be highly durable and easy to use. It is equipped with a 7-amp heavy duty motor capable of providing a smooth, even finish in any kind of wood. The frequency of passes on the surface is reduced because of the 3/32-inch maximum cutting. It can use reversible carbide blades for more detailed and more accurate woodwork. This planer contains a calibrated depth adjustment knob for more accurate depth settings. The back shoe of the planer is not ground flat. The cutter extends way past the back shoe. The front and back shoes of the planer are not parallel. It does not come with a dust collecting system. The planer still cuts even when it is set to zero. It produces a lot of shavings and sawdust. Makita KP0810 7.5 Amp 3-1/4-Inch Planer is able to plane as much as 3-1/4 inches wide and 5/32 inches deep in one pass. Its two-blade cutter head has a speed of 16,000 revolutions per minute – that might guarantee a smoother finish and faster removal of stocks and excess material. This planer is also built with a depth adjustment knob which features an easy-to-read scale for more precision in depth adjustments. With a rubberized handle, this handheld planer from Makita is comfortable to use and it lessens fatigue when used for a long period of time. This handheld planer manufactured by Makita is equipped with a 7.5-amp motor which seems to be promising. With its two-blade cutter head, it is capable of 16,000 revolution per minute, thus delivering more output power and an increased stock removal rate. The depth adjustment knob of this planer comes with an easy-to-read scale that click-stop in every 0.1 millimeter increment. Such feature results to more precise depth adjustments. The planer’s front base showcases 3 chamfering grove choices: approximately 4 millimeter, 1.4 millimeter and 3 millimeter. With rigid die-cast aluminum housing along with an all-ball construction, this planer is built for a long-term usage. It is also quite durable – it might withstand scratches and dents because of an increased durability. The planer only weighs 7.3 pounds, resulting to a high power and weight ratio. Its center is ergonomically designed to balance the planer along with front and rear handles that are rubberized for a more comfortable usage. This planer is also loaded with spring which elevates its base and protects the blade as well as the workpiece. Such spring loads also give the tool a resting spot. The planer’s 7.5-amp motor along with the two-blade cutter head delivers more power and output. It is equipped with double edge carbide blades for excellent performance. With rigid die-cast aluminum casting and all ball bearing construction, this planer is durable and, thus, has a long tool life. This planer contains a depth adjust knob with an easy-to-read scale. The planer’s front base is equipped with 3 chamfering groove selection: 1.4 millimeter, 3 millimeter and 4 millimeter. With only 7.3 pounds as a weight, this planer has a high power-to-weight ratio. Its center is ergonomically balanced and its handles are rubberized for a more comfortable use. The planer also contains a spring-loaded stand which elevates the planer to protect the blade and the workpiece. It comes with blade gauge assembly, a wrench, a guide rule, a depth guide and a blade set. It might become noisy once a dust collector is attached to the planer. The planer does not come with some kind of chip-collecting bag or a diverter shield on the chip outlet hole. It does not come with a case and a dust bag. It has some restrictions during application and it is limited in terms of the width. The thin tungsten carbide blades might easily break. Bosch PL2632K Planer with Carrying Case, 3 1/4" is a powerful planer with a 6.5-amp motor capable of 16,500 revolutions per minute. It promises faster removal of stocks and excess material as well as a smoother finish in both soft and hard woods. This planer features an ambidextrous off lock release button to prevent unintentional start-ups and an on lock release button for extended uses. With a spring-loaded stand, it elevates the planer to protect its blade as well as the workpiece, thus also providing the tool with a resting spot. Its front and rear shoes are housed in aluminum; precision-machined together every after assembly to guarantee its accuracy. The planer’s versatile two-blade system may also be replaced with large, high-speed steel blade. This planer’s 6.5-amp motor can do 16,500 revolutions per minute – such speed is enough to finish your smoothing woodwork. Other than that, it also promises a faster removal of stock and excess material while leaving a smooth finish behind. It could work on any type of wood, including soft and hard woods. The ambidextrous lock on and off release button feature of this planer makes it convenient and easy-to use. Its lock off release button helps prevent unplanned start-ups that might lead to accidents while its lock on release button is useful during extended uses. Its aluminum housing makes this planer a durable and efficient planer. This planer has a spring-loaded stand installed; it elevates the planer with the purpose of protecting the blade underneath and also to provide the tool a resting spot. With a versatile two-blade system, the blades inside the planer can be replaced with large, high-speed steel blades. Also, its aluminum front and rear shoes are precision-machined to guarantee accuracy. This planer’s 6.5-amp motor with 16,500 revolutions per second promises faster removal of stock and a smoother finish in both soft and hard woods. It features a lock on and off release button which help prevent unintentional start-ups and for a convenient extended usage. The planer contains a spring-loaded stand which elevates the tool to protect the blade and to provide the tool a resting spot. Its aluminum front and rear shoes are precision-machined, guaranteeing you the planer’s accuracy. With versatile two-blade system, the planer can also use large, high-speed steel blades. The planer comes with 2 wood razor micro-grain blades, a dual-mount guide fence, a straight no-mar plastic overshoe for fence, a 3-degree no-mar plastic overshoe for fence, a shavings bag, a blade wrench and a carrying case. The planer’s touching aluminum surface is too soft – it easily gets scratches all over it. It is not recommended for heavy commercial uses. It produces a heap of wood shavings even for small projects. One review I have read from a customer stated that this handheld planer is one of the best portable planers in the market. He indicated that this planer from Makita has features that cannot be found in others – machine precision, exact alignments, good balance, easy to use and durable. However, the same customer has also complained about the planer not coming with a carrying case. Another review I have read from a customer pointed out that this planer works great until the dust collector is attached. The customer indicated that once you hook up the dust collector, it starts to become noisy. Also, according to another customer, the planer’s edge guide, the single point attachment and the lack of solids make this planer useless – it does not function the way it is advertised. Overall, this handheld planer seems to be a good one despite some of the comments concerning its lack of a carrying case, the issue about the dust collection system and the uselessness of some features. With a rating of 4.7 stars, this handheld planer might just be the ideal planer for you planing needs. RYOBI HPL52K 6 Amp Corded Hand Planer, 3-1/4"
If you still do not find the kind of handheld planer you are looking for in the abovementioned categories, don’t worry, there are still other handheld planers you could check out. Below are a few more handheld planers which contain amazing features – these might be just what you need. If you are looking for a cordless, lithium-ion-powered handheld planer, this handheld planer from Makita might be a good choice. Makita XPK01Z 18V LXT Lithium-Ion Cordless 3-1/4-Inch Planer features 2 cutter head blades which have double-edged carbide blade for better performance and smoother finishes. This handheld planer promises to plane as much as 3 ¼ inches wide and 5/64 inches deep in one pass. Its motor is capable of 14,000 revolutions per minute – enabling faster stock and excess material removal. For more precision in depth adjustments, the planer contains a click depth adjustment knob with an easy-reading scale which could be set from 0 to 5/64 inches. Makita KP0800K 3-1/4-Inch Planer Kit might be the ideal handheld planer if you need one that features a 6.5-amp motor, higher power-weight ratio, precise aluminum machine base and an easy systematic blade setting. This planer’s 6.5-amp motor provides more powerful outputs for faster removal of material compared to other handheld planers. Its motor is capable of 17,000 revolutions per minute – such speed might guarantee an instantly smooth finish. Other than that, the planer can also plane as much as 3-1/4 inches wide and 3/32 inches deep in one pass. With an ergonomic design, it might ensure faster blade installations and changes as well as planing accuracy. This handheld planer by Bosch contains a 6.5-amp motor, spring-loaded stands, double-mounted guide fences with shield protection, and an angled handle. Its 6.5-amp motor can do 16,500 revolutions per minute – that is enough speed for a fast removal of stocks and it might guarantee smooth finishes on both softwoods and hardwoods. With spring-loaded stands, it elevates the planer to protect the blade and provides a resting spot for the tool. Other than that, the planer is also equipped with dual-mount guide fences with protective shields for steadier planing of vertical edges. Plus, its handle is angled in a forward motion, giving you a soft grip. This planer is not only efficient, it is also easy and comfortable to use. This curved base planer from Makita might be ideal for arch and arc creation in timbers as well as scarf works in logs. With a 9.6-amp powerful motor, the planer is capable of 15,000 revolutions per minute. Such speed might provide and ensure a smooth finish. In addition to that, the planer contains precisely-based machine – it could notch out logs at a rate of 12-5/8 inches curved radius. The planer also features an on-locking button for continuous usages. It is also ergonomically designed; the front and rear handles and grips are bigger and conveniently located to give you more control over the planer. If you want a handheld planer which comes with a kit containing a rabbeting fence, a dust adaptor, a blade depth setting gage, a socket wrench and two reversible carbide blades, then DEWALT D26677K 3-1/4-Inch Portable Hand Planer Kit might be just what you are looking for. The planer is equipped with a heavy-duty 5.5-amp motor that could do 34,000 cuts within a minute – such speed helps provide a smooth and even finish and it might guarantee a faster rate of removal in different types of wood. It also contains reversible carbide blades which improve the blades’ life and ensure a nice material finish. Other than that, this planer’s handles are conveniently designed to guarantee a comfortable use and prevention of user fatigue. 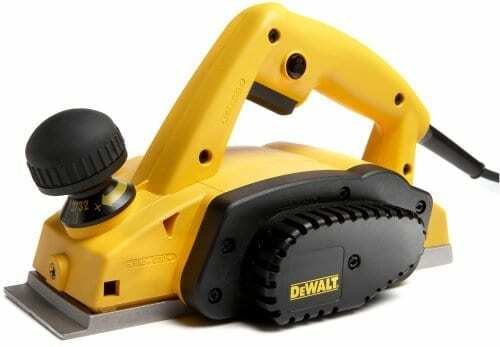 DEWALT D26676 3-1/4-Inch Portable Hand Planer is an imported, efficient handheld planer which might produce smoother and more even finishes in any type of wood surfaces. With a 5.5-amp motor, it is capable of 34,000 cuts per minute, thus achieving a faster rate of removal and smoothing. It also includes an industry standard of large, high speed, steel blades which could be re-sharpened for straighter edging or framing usages. Its calibrated depth adjustment knob can be adjusted to 1/16 inches. Other than that, the planer also accepts the use of reversible carbide blades for the improvement of its finish and blade. If you need a planer which has a compact and small design, then Makita 1912B 7.5 Amp 4-3/8-Inch Planer might satisfy your need. The planer is equipped with a 2-blade cutter head which can make 32,000 cuts per minute – it promises faster removal of stock and material. Other than such feature, the planer is also constructed with an all-ball bearing to extend its tool life. With a dimension and weight of 9.3 pounds and 14.9 x 7.7 x 7.5 inches, it can be easily carried and stored anywhere. Despite the compact size, it is heavy duty – its 7.5-amp motor offers an improvement in performance. This planer can plane up to 4-3/8 inches wide and 1/16 inches deep in one pass. This 3-1/4-inch planer from Black & Decker offers versatile functions, making it useful in different surfaces. Its 5.2-amp motor can do as much as 16,500 revolutions per minute and it is capable of 5/64-inch deep cuts. Since it is capable of a 5/16 rabbeting depth and a chamfering groove, it allows a more decorative work finish. The planer also offers 10 positive stops and a front depth adjustment handle. It is also equipped with an on-locking button which can be beneficial when used for a long period of time. This planer comes with an edge guide, 4 reversible carbide blades, a dust bag vacuum adapter, and a kit. With a price range of $60-$70, this planer is packed with features at an affordable price. PORTER-CABLE PC60THPK 6.0-Amp Hand Planer features an 11.5 inches aluminum-casted shoe which enables a more controllable use and a better quality finish. Its heavy duty 6-amp motor promises smoother cuttings in both soft and hard materials. Other than the abovementioned features, the planer also contain as much as 5/64-inch rabbit depth, thus removing more material every pass. Its 5/64 inches cut depths allow faster excess material removal. Plus, the planer uses HSS or carbide blades – it is flexible to all kinds of blades available. This planer is ergonomically designed to give you more comfort and convenience in every use. 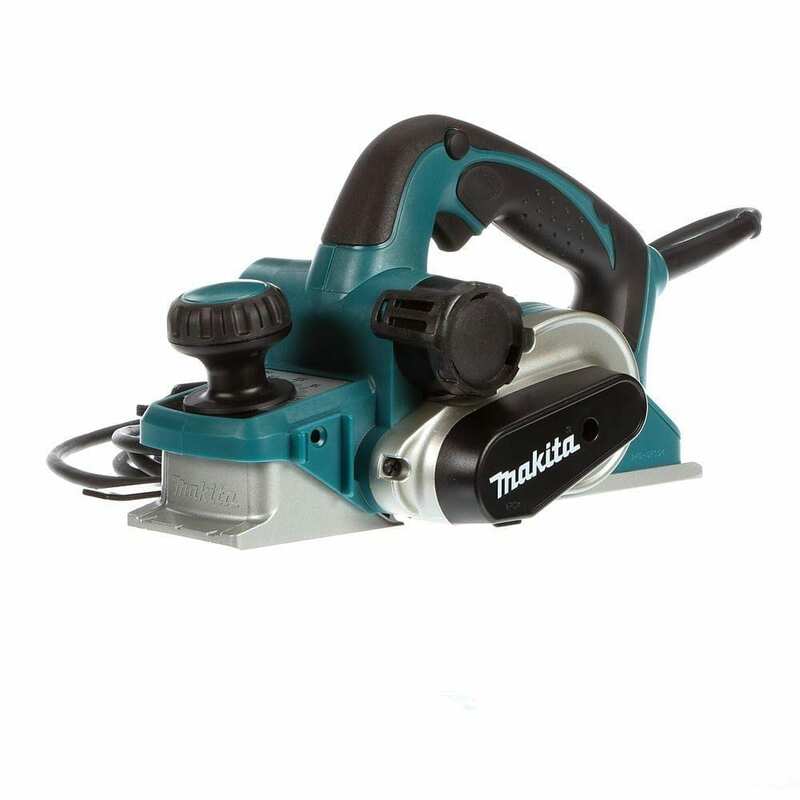 Makita’s 10.9-amp 6-3/4-inch planer might be the ideal planer if you are shopping for a double insulated handheld planer that comes with a sharpening holder assembly, a wrench, a triangular rule, a guide rule, a blade set and a wooden tool case. The planer is equipped with an efficient 10.9-amp motor capable of 15,000 revolutions per minute – it can cut 6-3/4 inches width in one pass. It is designed with a comfortable handle to lessen user fatigue and to provide an easy depth setting for a more convenient use. The planer is also constructed with large, sturdy sole plates to add to its stability. Other than that, the planer’s front and back grips are also perfectly aligned to give you a better control. This lightweight, budget-friendly and efficient planer from SKIL might be a nice pick if you need one that contains a powerful motor, adjustable auxiliary handles and a planer accessory kit. The handheld planer features a powerful 5.5-amp motor that is great for leveling and smoothing uneven joined boars, creation of ground clearances, smoothing of rough surfaces as well as decorative edging. It comes with two reversible carbide blades and a front and rear-machined shoes, offering smoother cuts in every use. The included on-board wrench storage helps provide convenience and availability assurance. Other than the features above, the planer is also equipped with an 11-position depth control knob for micro-adjustments precision. Triton TPL180 1500W Triple-Blade Planer, 7-Inch is equipped with a 1,500-watt motor which is great for heavy duty uses such as hardwood planing. Its 7 inches plane width provides faster removal of material in one pass. The planer also contains a 3-blade drum design that offers excellent cutting moves and smoother finishes. For material removal precision, the planer is built with a 10-poisition depth control dial. Also, its bail handle can be adjusted – it provides utmost support and better control of the planer in every use. Instead of hiring someone to smooth your door’s edges or remove paint on some piece of wood, buying a high-quality handheld planer which can help you do both is a nicer solution. However, you have to thoroughly check the tool before paying for it. I learned that in a hard way. Makita KP0810 7.5 Amp 3-1/4-Inch Planer is a highly recommended handheld planer. Not only because it was manufactured by a reliable company, but also because it is packed with amazing features: an efficient 7.5-amp motor, a depth adjustment knob, a durable housing and also, and it is ergonomically designed – all in all, it seems like a promising handheld planer. Want to check it out? Click here!